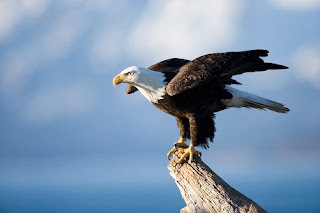 when grace goes deep in a ransomed heart: He always lifts me.. this time to be an eagle! He always lifts me.. this time to be an eagle! 1) Vision - Just like the eagle, all leaders must have vision. The eagle's eyes can see great distances. They can also directly into the sun without being blinded. 2) Eagles Never Eat Dead Meat - You will never see an eagle eating meat that it did not kill. An eagle is not a scavenger. It hunts for and kills its own food. It hunts for the prey while it's warm and alive. You as a leader must go where the action is. 3) Looks For & Flies Into Storms - As storms approach, lesser birds head for cover, but the might eagle spreads its wings and with a great cry mounts upon the powerful updrafts, soaring to heights of glory. Eagles use the storm to lift him to these great heights. Leaders use storms (challenges); we don't run from them. To leaders, storms are tools used for their development. 4) Very Gentle & Attentive To Their Young - The eagle is known for its ferocity, yet no member of the bird family is more gently and attentive to its young. At just the right time, the mother eagle begins to teach her eaglets how to fly. She gathers an eaglet onto her back, and spreading her wings, flies high. Suddenly she swoops out from under the eaglet and as it falls, it gradually learns what its wings are for until the mother catches it once again on her wings. The process is repeated. If the young is slow to learn or cowardly, she returns him to the nest, and begins to tear it apart, until there is nothing left for the eaglet to cling to. Then she nudges him off the cliff. You might have heard the argument about whether great leaders are born or made. The fact is great leaders are born but great leaders are also made. I admit that I am not a born leader. But im definately being made into one by God. I also admit that its hard and tiring! Totally not what i would naturally want to do. I mean, i can lead when i want to. But when it comes to things that i don't naturally want to care about, hmmm... I might chose to just let it slack =P having the "not my problem anyway, why should i care so much.." kind of attitude. but as i let God's glory shine on those dark areas (bo pien i always go to where the glory shines- church lor), it definately drives out all these 'shadows' in my life, and God has changed me to be more like Him, to have His heart, which is a heart that cares and loves unconditionally. So.. i basically have no choice but to change, when i get exposed to the "SON" (sun) and so here I am.. blogging about this, because I care, and want to make a difference in lives. This is yet another time where God has spoken so clearly to me.. so inspiring! Indeed, as the homepage image of my blog says "I Will Exalt the One Who LIFTED me!" He always lifts me!! and this verse was not chosen by accident. Reveal to me my true level of influence on others. Show me my weaknesses so that i may submit them to You for Your grace. Strengthen me so that i can serve You better through leadership, and increase my influence with others. Teach me to be a salt and light to others, not to benefit myself, but to add value to others. And above all, empower me to place my family first when it comes to leadership. Let me influence begin with a modeling of a faithful life. The more the devil says i'm mediocre or a failure, the more im gonna rise up, blog, talk, care, and train others to be Your leaders. In you mighty name I pray and thank you for everything! Amen. No matter how many times, and how many creative ways i will fall and fail, God still is and will forever be- My righteousness and holiness, The Lifter of my head! Yeah man.. no matter leaders are born or made, they are still CHOSEN by THE ONE! Cheerio on Michi... Continue to stand firm on Him and He shall lead your path! God bless babe! Really good post Mich! Fly and soar higher! thanks girls.. God is forever faithful and forever amazing! May u experience God bringing you to greater heights with Him, taking advantage of storms to soar to higher heights! I want many things too..
2010... i can smell the things coming! !